The data products, consisting of almost 750 site-years of observations, can be used for phenological model validation and development, evaluation of satellite remote sensing data products, to understand relationships between canopy phenology and ecosystem processes, to study the seasonal changes in leaf-level physiology that are associated with changes in leaf color, for benchmarking earth system models, and for studies of climate change impacts on terrestrial ecosystems. This data set contains 133 network site descriptions files (in both *.txt format and *.JSON format), 1082 region-of-interest definition (ROI) files in TIFF format, 1082 sample images for each image mask file in .jpg format and 1224 *.csv files, including ROI index files, and time series of extracted image color and greenness transitions processed to 1- and 3-day intervals. Figure 1. 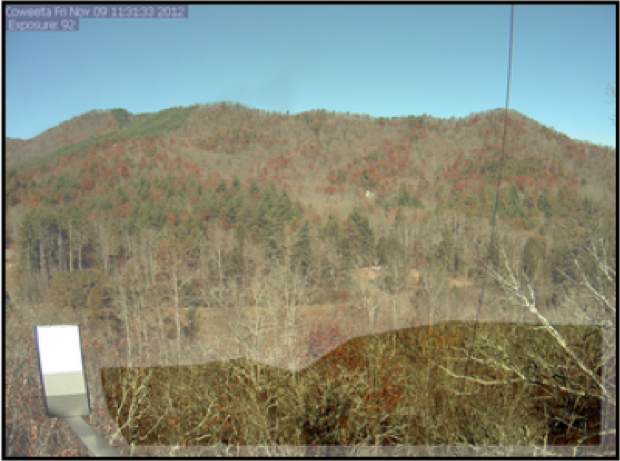 PhenoCam Network image from the Coweeta, North Carolina site. The region of interest (ROI) at the time this image was acquired was the transparent area with deciduous vegetation in the foreground. This data set provides time series of vegetation phenological observations for 133 sites across diverse ecosystems of North America and Europe from 2000-2015. The phenology data were derived from conventional visible-wavelength automated digital camera imagery collected through the PhenoCam Network at each site. From each acquired image, RGB (red, green, blue) color channel information was extracted and means and other statistics calculated for a region-of-interest (ROI) that delineates an area of specific vegetation type. From the high-frequency (typically, 30 minute) imagery collected over several years, time series characterizing vegetation color, including canopy greenness, plus greenness rising and greenness falling transition dates, were summarized over 1- and 3-day intervals. The development of PhenoCam has been funded by the Northeastern States Research Cooperative, NSF’s Macrosystems Biology program (awards EF-1065029 and EF-1702697), and DOE’s Regional and Global Climate Modeling program (award DE-SC0016011). We acknowledge additional support from the US National Park Service Inventory and Monitoring Program and the USA National Phenology Network (grant number G10AP00129 from the United States Geological Survey), and from the USA National Phenology Network and North Central Climate Science Center (cooperative agreement number G16AC00224 from the United States Geological Survey). As described in the paper by Richardson et al. (2017), the PhenoCam Dataset v1.0 consists of a set of 5 data records for each site. The data can be accessed directly in the ORNL DAAC data pool at https://daac.ornl.gov/data/global_vegetation/PhenoCam_V1/ (after login). Files in the data pool are organized as follows. Here, <sitename> is the name of each camera site, <veg_type> is a two-letter code defining the type of vegetation for which data have been processed, and <ROI_ID_number> is a unique identifier to distinguish between multiple ROIs (regions of interest of the same vegetation type for a given site. The Phenocam data can also be downloaded from the dataset landing page (https://daacdataset.ornl.gov/cgi-bin/dsviewer.pl?ds_id=1511), where all 3654 data files are presented without the directory structure mentioned above. Specific sites or data file types can be selected using the filter box at the top right of the data file list. For example, all 22 data files for the Acadia National Park site in Maine can be retrieved by typing "acadia" in the filter box, checking the checkbox for "Select All" , and clicking on the "Add Checked Items" button below the table. The data files will then be delivered using the ORNL DAAC Shopping Cart. These files provide general metadata for the PhenoCam network sites from which processed imagery has been included in this data set. Following general project information, site specific location, contacts, date range, and environmental and ecological characteristics are listed. The fields are specified as key-value pairs. There are 133 sites (files) in standard text format (*.txt) and named as: <sitename>_meta.txt where sitename is the name of the respective camera site, e.g., acadia_meta.txt. The 133 machine-readable JSON files are named as <sitename>_meta.json. These files provide (1) the “ROI list files”, which detail the date and time range over which each binary image mask was applied in processing the image data for a site; and (2) the binary “image mask file”, which delineate the ROI over which the image analysis was conducted and (3) sample images for each image mask file. With (1) and (2) the data presented in the *_roistats.csv data files can be reproduced from the original image files. Where <sitename> is the name of the network camera site, <veg_type> is a two-letter abbreviation identifying the dominant vegetation within the ROI, e.g. DB for deciduous broadleaf trees (see Table 1), and <ROI_ID_number> is a numeric code that serves as a unique identifier to distinguish between multiple ROIs of the same vegetation type at a given site (0001 for the first ROI list, 0002 for the second, etc.). The first 13 lines (beginning with #), document the provenance of the ROI list, and contain a brief description of the vegetation that is delineated by the associated image masks. Line 14 lists the column headers for the mask entry rows. Note that only images within the date and time ranges (from start_date and start_time to end_date and end_time) listed are included in the processed data set generated from this list. For end_date, the date code 9999-12-31 is used to keep the processing open-ended. These are the binary “image mask files”, which delineate the ROI (black for the ROI and white for the region to exclude from calculations) over which the image analysis was conducted. There are 1082 files in TIFF (*.tif) format and are named as <sitename>_<veg_type>_<ROI_ID_number>_<mask_index>.tif . mask_index matches the entry number in the list (01 for the first entry, 02 for the second entry, etc.). Vegetation type abbreviations for ROIs (region of interests). These files contain the high-frequency (typically, 30 minute) color information extracted from the entire image archive for each site, using the ROI list files and image mask files note in the previous described data files. For each archived image, RGB (red, green, blue) color channel information, with means and other statistics calculated across a region-of-interest (ROI) delineating a specific vegetation type was extracted. From the high-frequency (typically, 30 minute) imagery, time series characterizing vegetation color, including “canopy greenness”. The providers refer to these as the “ROI statistics” time series files. The time series have not been filtered, and each data row in the file corresponds to an individual image in the archive. Where sitename, veg_type, and ROI_ID_number are the same as previous described. Line 4 contains the sitename, identical to that in the filename. Lines 5 (veg_type) and 6 (ROI_ID_number) identify the vegetation type and the ROI_ID from the ROI list files. Lines 7-9 are site location (latitude and longitude in decimal degrees, and elevation in m above sea level. Line 11 indicates whether images have been re- resized to common dimensions (to match the size of the mask file) prior to analysis. Line 12 indicates the version of the data set. Lines 13-16 document the provenance of the data file. Line 18 lists the column headers for the data rows. The data rows begin on line 19 with each data row corresponding to results for an individual image in the archive. These files contain the daily summaries of the high-frequency (typically, 30 minute) time series data characterizing vegetation color, including “canopy greenness” for each site. As noted previously, for each archived image, RGB (red, green, blue) color channel information, with means and other statistics calculated across a region-of-interest (ROI) delineating a specific vegetation type was extracted. From the high-frequency (typically, 30 minute) imagery, time series characterizing vegetation color, including “canopy greenness” was processed to 1-day intervals. There are 204 1-day summary product files named as <sitename>_<veg_type>_<ROI_ID_number>_1day.csv. Where sitename, veg_type, and ROI_ID_number are the same as previous described. The first 24 lines (beginning with #) contain basic metadata. Lines 4 through 10 are identical to those in the all-image time series file from which the summary product files are derived. Line 11 is not used in the data sets but allows for the specification of an image count threshold for processing to occur (i.e., if for a given period of aggregation, there are insufficient images available, then only results for the midday image, if applicable, would be reported). Line 12 gives the number of days that have been aggregated in producing the file, which is 1 day. Line 13 reports the solar elevation filter that was used in processing (10° in the current data set). Lines 14 and 15 are not used in the data sets but allows for the specification of time-of-day window (i.e., images outside of the window would be excluded from the processing). Lines 16 and 17 report the values that were used for the “too dark” and “too bright” quality control filters, which are by default set to DN 100 and 665, respectively. Lines 18-23 document the provenance of the data file. Line 25 lists the column headers for the data rows. 5 = snow on trees (and ground; used for treed sites). If the midday image was not evaluated, a value of NA is assigned. These files contain the 3-day summaries of the high-frequency (typically, 30 minute) time series data characterizing vegetation color, including “canopy greenness” for each site. As noted previously, for each archived image, RGB (red, green, blue) color channel information, with means and other statistics calculated across a region-of-interest (ROI) delineating a specific vegetation type was extracted. From the high-frequency (typically, 30 minute) imagery, time series characterizing vegetation color, including “canopy greenness” was processed to 3-day intervals. There are 204 3-day summary product files named as <sitename>_<veg_type>_<ROI_ID_number>_3day.csv. Where sitename, veg_type, and ROI_ID_number are the same as previous described. Line 12 gives the number of days that have been aggregated in producing the file, which is 3 days. Lines 16 and 17 report the values that were used for the “too dark” and “too bright” quality control filters, which are by default set to DN 100 and 665, respectively. Lines 18-23 document the provenance of the data file. Line 25 lists the column headers for the data rows. These data files contain the transition date estimates for the start of each “greenness rising” stage and end of each “greenness falling” stage, derived from the 1-day and 3-day summary data. There are 408 transition date files. The first 16 lines (beginning with #) contain basic metadata. Lines 4 through 6 are identical to those in the summary product file from which the transition date file is derived. Line 7 gives the number of days that have been aggregated in producing the file, which is either 1 day (if transition dates are calculated from Data Record 4) or 3 days (if transition dates are calculated from Data Record 5). Lines 8 and 9 define the first and last years for which the transition dates are calculated. Lines 10 and 11 document the provenance of the data file. Lines 12-15 report goodness-of-fit statistics (in terms of RMSE, the root mean squared error) for the spline curves from which the transition dates are extracted. Line 17 lists the column headers for the data rows. The data rows begin on line 18, and for each data row, corresponding to a single “greenness rising” or “greenness falling” stage. indicates whether the reported transition dates correspond to a “greenness rising” or “greenness falling” stage. Note that there may be more than one rising/falling cycle per calendar year, and a single rising or falling stage may cut across years. Data derived from PhenoCam imageries can be used for phenological model validation and development, evaluation of satellite remote sensing data products, understand relationships between canopy phenology and ecosystem processes, to study the seasonal changes in leaf-level physiology that are associated with changes in leaf color, benchmarking earth system models, and studies of climate change impacts on terrestrial ecosystems (Richardson et al., 2017). Following are brief excerpts from Richardson et al. (2017). See this publication for more details. The PhenoCam network is a cooperative network, established in 2008 and uses digital camera imagery to monitor ecosystem dynamics over time. It serves as a long-term, continental-scale, phenological observatory with cameras deployed within North America, from Alaska to Texas, and from Maine to Hawaii (Figure 2), and some on other continents. 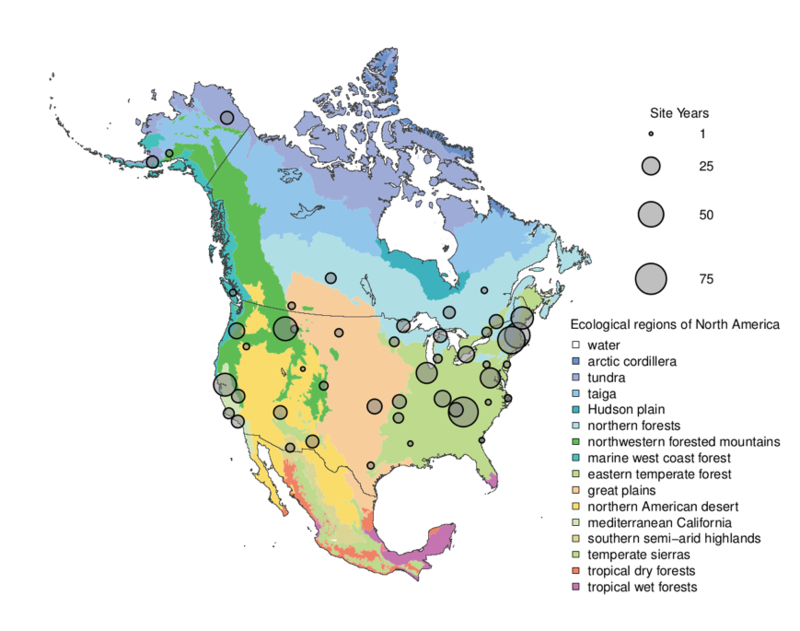 Figure 2: Spatial distribution of PhenoCam data across ecological regions of North America. Background map illustrates USA Environmental Protection Agency Level I Ecoregions. Data counts have been aggregated to a spatial resolution of 4°, and the size of each circle corresponds to the number of years of data. Sites in Hawaii, Panama, and Europe are not shown. The data sets presented here are derived conventional, visible-wavelength, automated digital camera imagery from over 400 cameras, together totaling almost 750 years of data across different ecoregions, climate zones, and vegetation types. Vegetation types such as deciduous broadleaf forests (392 site-years of data in the dataset), grasslands (121 site-years), and evergreen needleleaf forests (80 site- years) are the best-represented. For each archived image, RGB (red, green, blue) color channel information, with means and other statistics calculated across a region-of-interest (ROI) delineating a specific vegetation type was extracted. From the high-frequency (typically, 30 minute) imagery, time series characterizing vegetation color, including canopy greenness (canopy greenness index -- the green chromatic coordinate, Gcc) processed to 1- and 3-day intervals was derived. For ecosystems with one or more annual cycles of vegetation activity, uncertainties, for the start of the “greenness rising” and end of the “greenness falling” stages has been provided. Every night, any new images that have been uploaded to the server during the previous 24 hours are copied to the data archive, and then processed and analysed as described in Richardson et. al., 2017. The processing is conducted using scripts coded in Python. The scripts used for image processing, including extraction of colour information, and generation of ‘all-image’ and ‘summary’ time series data product files, are available at https://github.com/tmilliman/python-vegindex/ with an open source license agreement. Image analysis consists of several steps. First, an appropriate “region of interest” (ROI) is defined, corresponding to the area within each digital image for which color information will be extracted. The ROIs characterize the dominant vegetation type in each image. For sites where more than one vegetation type could be clearly identified, secondary ROIs are selected. The ROI coordinate definitions are stored, in TIFF format, as a series of binary image masks, which comprise an ROI’s “mask sequence”. For each ROI mask sequence at each site, an “ROI list file” detailing the date and time range over which each mask is to be applied. The digital cameras record JPEG images with color information stored in three separate layers (red, green, and blue; RGB). According to the standard additive color model, representation of any given color in the visible range is achieved by varying the intensity (pixel value) of these primary colors. Thus, each pixel in the image is associated with a digital number (“DN”) triplet, with each element in the triplet corresponding to the intensity of one of the color layers. Therefore, the second step in the image analysis is to read in the images, and associated mask sequence, and to characterize the frequency distribution of the RGB DN triplets across the mask. This is done separately for each ROI at each site, to produce the “ROI statistics” time series data files. For each image, the date and local time were extracted from the image file name. In addition, the solar elevation angle based on the date and local time stamp, using standard formulas is also calculated. The frequency distribution of the RGB DN triplets across the mask was characterized on a channel-by-channel basis, and also in terms of the pairwise correlation of DN values between color channels. Thus, for each of the red, green and blue color channels, the mean and standard deviation, as well as the 5th, 10th, 25th, 50th, 75th, 90th, and 95th quantiles, of the DN distribution across all pixels in the ROI was determined. Using an approach similar to the “spline interpolation” method that has been previously applied to PhenoCam data, phenophase transition dates for each ROI mask sequence has been extracted. These are intended to define the start of the “greenness rising” and end of the “greenness falling” stage for a full cycle of vegetation activity (i.e., from dormancy, through green-up or “greenness rising”, peak activity, senescence or “greenness falling”, and back to dormancy). Channan, S., Collins, K. and Emanuel, W.R., 2014. Global mosaics of the standard MODIS land cover type data. University of Maryland and the Pacific Northwest National Laboratory, College Park, Maryland, USA, 30.